For additional information, contact Jenny Bendel. With this integration, D20PRO Game Masters will be able to control Syrinscape remotely on the systems of their players. Game Masters will be able to embed objects within D20PRO that can be used to ‘click’ buttons inside Syrinscape, without needing to bring Syrinscape into focus, or having to navigate through any of its menus. “Now every spell, every location, and every hideous monster roar is right at the finger tips of D20PRO Game Masters,” says Syrinscape creator Benjamin Loomes. “And yes… most importantly, that includes the Wilhelm Scream!”. D20PRO has created real-time video with an introduction demo on how to incorporate Syrinscape into D20PRO games, using Syrinscape in 3rd-party mode, how to add sound triggers inside D20PRO, and how to configure virtual audio settings. D20PRO Virtual Tabletop is available to try free with a 30-day Trial License to build campaigns, adventures, and encounters in no time. To start a free 30-day trial, visit, www.d20pro.com/getd20pro/. *At this time, Syrinscape integration is Windows only, with Mac OS and Linux integration coming soon. Using a powerful audio engine and complex algorithms to produce ever-changing soundscapes and rich encounter-specific music, Syrinscape conjures every aural landscape imaginable, from ethereal forests and stony shorelines, to dank, vermin-filled dungeons, to the spooky depths of the underdark. Designed by accomplished composer and tabletop gamer Benjamin Loomes, along with the developers at the Interaction Consortium, Syrinscape builds on more than 8 years of prototyping and community feedback. Syrinscape is based in Australia. 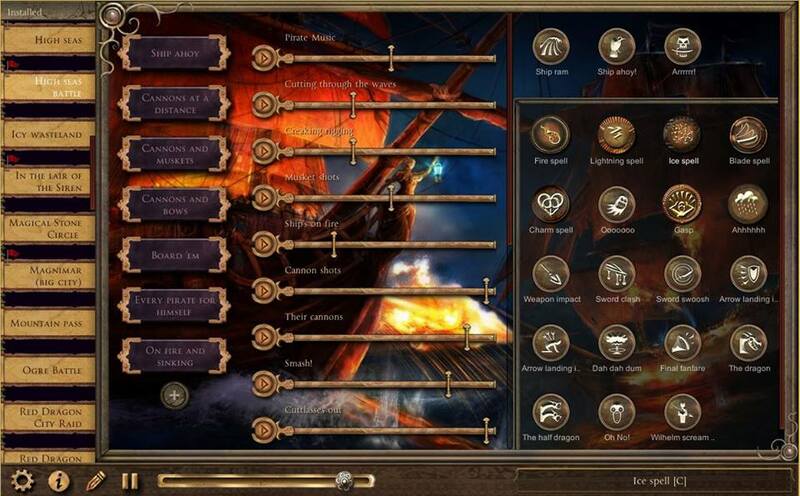 Syrinscape is available for a wide range of devices, including PC, Mac, Android Tablets and phone, iPhones and iPads, and the players can be downloaded via syrinscape for free.